The sight of the only Irish athlete besides Pat O'Callaghan to win a medal at successive Olympiads writhing on the canvas in agony in his hometown suggests that Paddy Barnes no longer has a bright future in boxing, just a distinguished past. 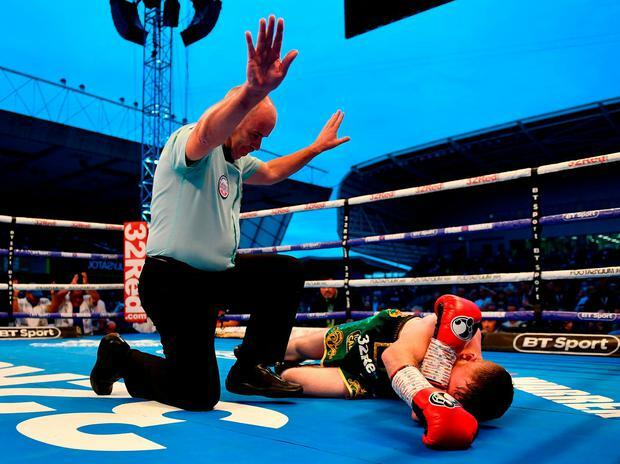 Barnes was attempting to dethrone defending WBC flyweight champion Cristofer "El Latigo" Rosales but ended up occupying an area of floor space at Windsor Park on Saturday night after being clinically KO'd by a textbook body shot. The power-punching Nicaraguan dispatched the 31-year-old three-time Olympian just before the end of the fourth round. Barnes had been enjoying a busy spell just before "El Latigo" (The Whip) lashed a right hook into his gut to dismiss the challenger comprehensively. Scottish ref Victor Loughlin started his count just before the bell for the end of the frame and continued after the gong but it was clear that Barnes was in no condition to continue. Many pundits believed that the Belfast fly went all in too soon in his sixth pro outing against a champion who is eight years his junior and who has now won 28 (19 KOs) of his 31 outings. But the Beijing 2008 and London 2012 bronze medallist, who will now serve a mandatory 28-day medical suspension after being KO'd, remained defiant after the first defeat of his paid career, commentating that he "dared to be great, failed, hit by a perfect body shot, well done (to Rosales)." Meanwhile, Rio Olympian Steven Donnelly won 40-36 on his pro debut on the Windsor Park undercard against Brighton super-welter Kevin McCauley, who has lost an astonishing 172 bouts in his 199-fight career. Belfast southpaw Sean McComb, stopped Nicaragua's Raynaldo Mora in the fourth round on his paid debut. while Steven Ward claimed a 79-75 points win over Steve Collins Jnr. to secure the Boxing Union of Ireland Celtic light-heavy title. Independent.ie Newsdesk Promoter Eddie Hearn says Jarrell Miller has failed a second doping test and as such a new opponent for Anthony Joshua will be announced next week.